If you’re new to the music game, creating the songs you love is a lot more complicated on the back-end than you might imagine. 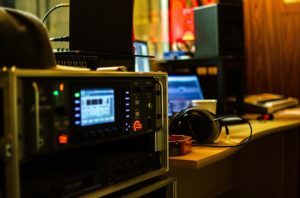 Although the movies make it seem like the only thing you need to record music is an instrument and a microphone, making professionally-sounding music requires all sorts of equipment to get the job done right. One indispensable piece of musical equipment that professionals use to make their music incredible is an audio interface. 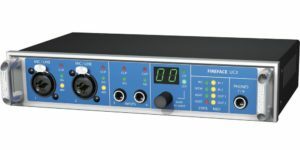 An audio interface is a piece of hardware that connects your audio gear and microphones to your computer. An audio interfaces allows your instruments to interpret digital information that is sent from your computer, as well as enables your computer to read the analog material coming from your instruments and microphones. If you’ve never used an audio interface before, they can look pretty intimidating at first glance. An audio interface has knobs everywhere, a panel of sound meters, and plug ports aplenty. 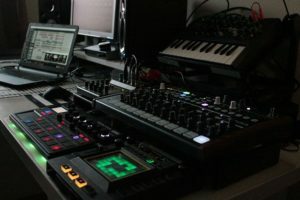 If you don’t have a lot of technical know-how, or you’ve never used an audio interface before, all of those knobs and meters are probably overwhelming. This is why we’ve created this audio interface buying guide. At Pickup Plug, we want to make the world of music more accessible for music-makers trying to figure out how to make their debut album. To start things off, our buying guide briefly describes the benefits offered by audio interfaces. After that, we’ll talk about the audio interfaces we’ve reviewed at Pickup Plug, and which interface is best for you. 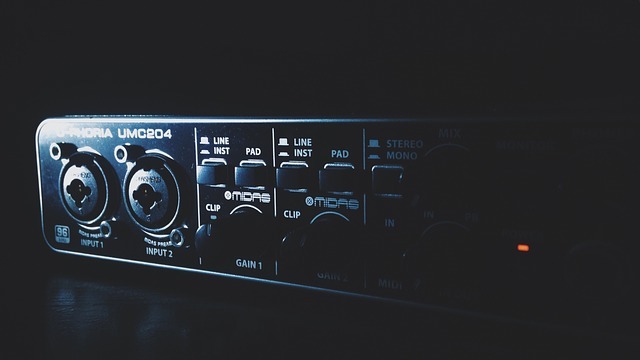 Before we get into helping you find the best audio interface for your next musical project, let’s take a second to talk about why audio interfaces are such a useful tool for improving your musical output. Put plainly, an audio interface will always improve the sound, quality, and clarity of your recordings. The musicians on the staff here at Pickup Plug all use audio interfaces when they’re recording their own musical projects in a studio. Similarly, when our employees are playing in concert somewhere for a live audience, they will also bring an audio interface with them to make it easier to properly route their sound. The most important benefit that audio interfaces offer to musicians is that interfaces allow you to play music in tandem with a computer. And let’s face it — most musicians creating sounds today are using computer-based editing programs to spruce up their sounds. This is because audio interfaces make it significantly easier to make the notes you’re strumming on your guitar into a song that can be played and enjoyed by your friends and fans all over the world. The most important factor to consider when you’re in the market for an audio interface is making sure you’ve buying one that is compatible with your laptop or desktop computer. At Pickup Plug, we carry audio interfaces that are compatible for either Apple or PC computers, as well as interfaces that are universally compatible with any style of laptop. At the moment, the best audio interfaces use a Thunderbolt connection. Considered by professional musicians to be the industry standard for audio interfaces, Thunderbolts are significantly faster than USB audio interfaces. More specifically, Thunderbolt interfaces can handle speeds measuring up to 40 Gbps, and can used with up to 100 feet of cable. FireWire audio interfaces are another popular pick for musicians seeking out a reliable audio interface. FireWire interfaces transfer data more consistently than USB audio interfaces, making them a great pick if you’re going on tour. The problem with using a FireWire interface is that not many computers have a built-in FireWire connector port. This means that if you own a Windows PC, you will definitely need a converter or you’ll have to install a FireWire card before using your interface. USB audio interfaces are ideal for those on the road, and also beginner musicians who are just starting to explore the world of recorded sound. What we like about USB audio interfaces at Pickup Plug is that USB audio interfaces are the most cost-effective audio interfaces we’ve reviewed. This means that young sound-makers can play around with their USB-based interface and see how it manipulates the sound of their music without having to break the bank. Another great thing about USB audio interfaces is that they can be universally used with Apple computers and Windows laptops. 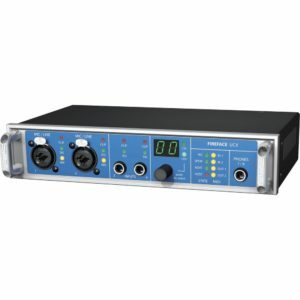 If you are producing your music on a desktop computer a PCIe audio interface probably the best way to go, but you’ll have to be a little more tech-savvy. A PCIe interface is an internal card that is inserted into a computer’s motherboard. These PC-embedded interfaces can handle lots of channel data at once, making them a great option for studio engineers. Unfortunately, because PCIe interfaces are placed into a computer’s motherboard, they cannot be used with laptops practically. The most basic audio interfaces we review are two-channel audio interfaces. These simple interfaces are capable of recording one stereo channel or two mono channels simultaneously. The more complex, high-end interfaces reviewed at Pickup Plug can handle quite a few different channels at once. Naturally, the more complex your recording needs, the more channels you’ll want to have at your disposal. 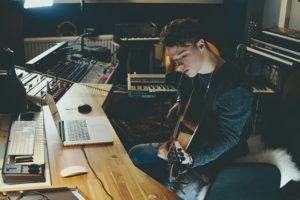 To dig into this a bit deeper, if you’re a singer-songwriter, you need an audio interface that can capture both your voice and your instruments on separate channels. If you’re playing with instruments like an electric guitar or electronic keyboard, seek out an audio interface that has instrumental inputs. You may also want to consider whether or not the audio interface has an output for monitoring with studio headphones, so that you can hear what is being recorded in real time. Audio interfaces are an extremely important tool for musicians who are recording or playing music through a computer. 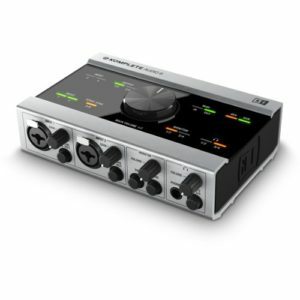 Professionals musicians who want a top-end audio interface should consider a Thunderbolt interface that has plenty of different channel options. Novice musicians wanting to learn about music production should opt for a USB audio interface with a couple of channels. We’ve reviewed both types of audio interfaces here at Pickup Plug, your one-stop online guitar shop. Finding perfection in any kind of audio software is tough. Audio engineers are notoriously prickly, after all, and there’s fault to be found anywhere. There are a few devices that are very close to perfect, though, and they should absolutely be cherished. One of those devices is the RME Fireface UCX. The hardest part about singing the praises of the Fireface UCX is figuring out where to start. It’s nice and compact, which makes it easy to use if you’re recording live. It’s got a good array of inputs and outputs and the device itself is really easy to use. It provides for great quality while you’re in the studio and even stands up to a fair bit of abuse if you take it on the road. It’s one of the very rare devices that doesn’t have any kind of outstanding problems – there’s not even anything to legitimately nitpick on this unit. You’re really not going to find many complaints with this audio input unit. Are there better IO devices out there? Probably. There are certainly devices that have more in the way of inputs and that can do more fancy tricks, but they are few and far between. What you have here is a solid piece of technology that won’t let you down no matter where it is used. This is precisely the kind of IO device that you’ll keep using until you run it into the ground. MOTU has a pretty stellar reputation in the world of sound. While it might not be the best-known name to consumers, it’s definitely one of those names that means something to people who do technical work. As with most well-known companies, though, you’ll always want to be careful when relying just on the name. Fortunately, the Ultralite definitely lives up to its reputation by providing a great user experience. There’s a lot to like with the Ultralite. The fact that it provides 18 simultaneous inputs and outputs is nothing short of miraculous in a package this small. There’s also the fact that it manages to do all that while still ensuring top-notch quality. It’s one of the few IO devices that are as good for playing around live as it is for recording, giving you great results no matter what you choose to do. It’d be nice if the box as was aesthetically pleasing as it is technologically sound, though. The black on black color scheme isn’t great for making fine adjustments, so get ready to use this one in good lighting (or with reading glasses). This is an incredibly small nitpick, but probably something about which users should be warned. If you know it’s coming, you probably won’t have an issue. If you open the box and look for the minor problem, though, you might find it a little annoying. All in all, though, it bodes well for the device that the only real problem is an incredibly minor nitpick. Good professional tools need to do a lot at once. While there are certainly arguments for simplicity, that simplicity should be in use and not performance. If you get a professional-level tool, you should be able to feel like you get everything you need from it. Fortunately, that’s largely what you get with the PreSonus Studio 192. There’s a fair bit to like here. Being able to do almost everything from a universal control application is really nice, especially if you are working with a lot of tools at once. The zero latency monitoring is also nothing short of amazing – it feels like it should be the standard in all similar devices. Beyond that, you’re looking at an audio input device that is a lot smaller than most found at this price point and that will do a good job standing up to most professional use. It’s not without its flaws, but it’s really a fantastic piece of work that’s fun to play around with. There are some stability issues with this product, though. In the search for simplicity, it looks like some of the programming tricks that are used to keep these devices working in a stable manner were left by the wayside. This is much more prevalent on Windows than on Mac, though, so at least a decent portion of the user base won’t be impacted. Customer service is also a little slow, but they do a decent job of handling problems. If you’re a Mac user or you don’t mind troubleshooting, though, this is still a really good choice. Focusrite makes a number of really outstanding audio input devices. Figuring out which one is right for you means looking through their catalog and ultimately deciding which functions are really necessary for your needs. The Saffire Pro is definitely an option for those who have some pretty significant audio needs, but it’s still easy enough to use that even beginners will get something out of the device. The Saffire Pro 40 lets you get a ton of work done with one device. It manages to work well with both PC and Mac, which is a minor miracle considering the trouble some other devices have crossing platforms. When you’ve got it up and running, you’ll find that you have more options than most really need. While it’s missing a few functions here or there, the truth of the matter is that most users will be more than happy to make use of all the functions including herein. Do take some time to check out your computer’s compatibility before buying this device, though. It doesn’t work with all Firewire connectors, so you might have to buy a new card if yours isn’t on the approved list. It’s more than worth it to make that second purchase, though, as this is a great input device. You might find a few quirks here or there, but you’ll be very happy with the device overall. It’s a great example of how providing a bevy of options can really pay off for users. It’s not necessary for an audio interface to have every option in the world for it to be a good choice. While there are definitely some IO devices out there with dozens of different inputs, but that doesn’t mean that it manages to do its job correctly. Sometimes, simplicity is really more of a selling point than anything else. 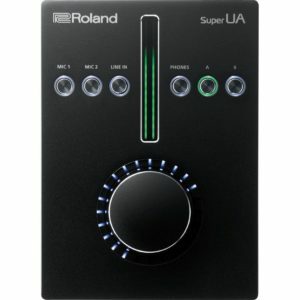 This is where the Roland Super UA really shines. When you look at the Super UA, you’ll probably be a little skittish about the exterior. It definitely doesn’t look like a lot of the other similar IO devices out there, and it almost looks a little too simple. In truth, what you’re looking at is a good bit of design work that’s gone into making this device look friendly. It’s certainly a little on the limited side, but that almost seems like it’s done by design. Instead of giving users a world of options, it just focuses on great sound quality. Are there issues here? A few. It requires a separate power cord, which is always a bit of a pain when using something that’s also plugged into a computer. It could also probably do with another pass on the software, but not to the extent that it really hurts the user experience. This is a good, simple professional device that will do the job for most who want to get their money’s worth for an IO device. You don’t need a whole studio to get a good recording session going. If you’ve got a decent computer, you can get a lot of mileage out of having a good audio input. While there are certainly a ton of options out there, it’s nice to know that a product like the Focusrite Scarlett is keeping things simple. It doesn’t take long for the Scarlett to show off its strengths. It’s not the most customizable interface out there, and that’s actually something of a selling point for new users. While it might not have all the options that a pro wants, it’s simple enough to get working that new users won’t get turned off by the complexity. It does only a few things, but it does those few things very well. That’s definitely a plus for those who just want to get a working audio input device for their computers. There are a few negatives to this product, though. The software itself isn’t great, and getting it to work correctly is probably going to be an exercise in frustration for most. That’s not the end of the world, of course, especially once you finally get things working correctly – you’ll just wish that you never had to go through the set-up in the first place. Beyond that, most problems users have found with this particular audio interface seem to be relatively isolated, so you can feel comfortable with your choice of interface. All in all, it’s a great product that’s definitely worth a look. 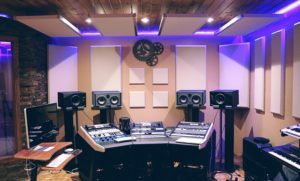 When most people think of audio recording, they think of a fully kitted-out studio that has dozens of different monitors and a ton of technology lying around. If not that, they certainly think of a high-end computer with all the bells and whistles ready for a lone recording artist to work wonders. It’s increasingly common, though, for work to be done on simple tablets. If that’s the route you want to take, you’ll need something that works with these portable systems. 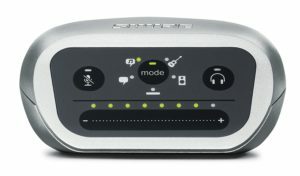 The Shure MVi definitely looks like it was made for the iPad generation. It’s slick and futuristic looking, though it holds a lot of the same technology that you’d find in any other similar device. It’s a solid piece of engineering that works well for those who record on tablets, which is a rarity in the audio world. While you might expect more in the way of bells and whistles, the real selling point is the lack of computer support you’ll need for it to run. Since this device really feels optimized for portable systems, you’ll notice that it doesn’t quite keep up with other professional units. The sound quality loss can be problematic and you’ll probably find something a little more traditional that works better with ease. If you absolutely need to use your tablet for audio work, though, this unit is a lifesaver. It looks good, travels well, and it gets the job done. There’s not much more you can ask of the device. It’s really interesting to see what a stellar hardware company can do with an audio input device. While there are definitely a lot of bells and whistles for which one can look, those devices that come from good hardware companies tend to focus on the basics. One of the better examples of this is found with the Native Instruments Komplete Audio 6. The Audio 6 is all about precision. It’s loud, clear, and incredibly easy to use. It’s not the kind of IO device that you’ll use when you need a thousand different custom options, but it is what you’ll choose when you want something that’s going to work every time. The set-up is very easy and you won’t even have to worry about finding a separate power source – plug it into your computer and you’ll be good to go. It takes a lot of the guesswork out of getting an audio input device up and running. Don’t count on customer support for this one, though. They’ll absolutely walk you through set-up and troubleshooting, but you’ll have to push to get this level of help. Most of your contact will have to be through e-mail, which is frustratingly slow. Fortunately, most users never have to call customer service in the first place. The device has a very easy set-up process and tends to work even after taking a bit of a beating, so any interactions with customer service should be sporadic. pickupplug.com is a participant in the Amazon Services LLC Associates Program, an affiliate advertising program designed to provide a means for us to earn fees by linking to Amazon.com and affiliated sites.